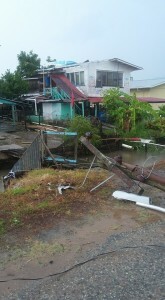 Residents on Leguan were up to late Monday trying to pick up the pieces after a freak storm damaged several houses and uprooted trees in the south-eastern side of that Essequibo Island. 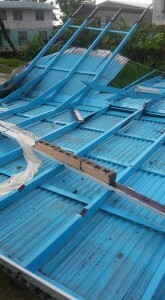 Several residents confirmed that the storm blew off the roofs of at least five houses and damaged a mandir’s roof at Blenheim on Sunday afternoon. Sources said electricity was restored to that section of the island on Monday, after technicians replaced a pole and cables. The storm tossed the roof of a wooden house off and slammed it into a utility pole sending it crashing to the ground and bursting cables. 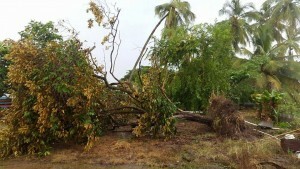 A number of fruit and coconut trees were also destroyed by the violent storm. Leguan is an 18-square mile agriculture-dependent island with an estimated population of 4,200 living in 27 demarcated villages.